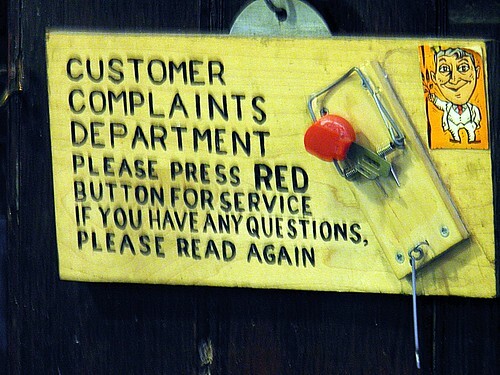 Home » Home » Dominate your marketplace with just 5 customer service tricks. Dominate your marketplace with just 5 customer service tricks. 5 star customer service is the easiest and quickest way to business super-stardom so use it! So many businesses seem to be afraid of any interaction with their customers that isn’t a simple sale. After sale service and customer relationship development is so poorly planned for and executed in most businesses that it is one of the simplest and powerful strategies you can spend your time working on. Try implementing these 5 ideas in your business and see how they can rapidly improve your performance. And why not share your own ideas and tricks in the comments below? Send cards not emails; if you’ve gone to the trouble of getting your customers’ permission to keep in touch the obvious thing to do is to keep communicating with them by email. However, because its so obvious and cheap; your customers can easily become complacent about it and just ignore all but the most impressive email headings. Try mixing it up a bit by sending them a hand written card or letter. If this isn’t about a special offer and is genuinely about looking after the customer after a sale then so much the better. Pop a chocolate in there for good measure. Talk don’t write; the obvious thing to do in communicating with customers is to write somehow; maybe email, maybe a blog post or a letter even. If you receive a letter or email from a customer about a complaint; phone them as soon as possible. They will be surprised to receive a call that aims to address their concerns because they are so used to being ignored and held at arms length on issues like this with other companies. Do what you say; it seems obvious but not many businesses do what they say. If you read the hype on many websites and marketing brochures you will usually get a very different impression of the company than if you walk into the premises. Most companies don’t do what they say they will. This makes it easy for you to attract and ring fence their customers. Magic moments; think of ways to install magic moments for your customers throughout their relationship with your business. Random acts of kindness are very impressive to most people. An extra doughnut for loyal custom or a special service when your customer is entertaining a friend or colleague at your establishment will go a long way to creating a lifelong customer and advocate. I’ve just used the word advocate. Re think your idea of a customer. Instead of someone who buys stuff from you, turn this on its head and think of them as people who sell stuff for you. If your minimum service objective is to make each customer want to talk about your business to others you will transform your performance rapidly.